I’m sitting here in this mezzanine (feels like an urban treehouse) as happy as can be, after a short walk around the grounds of the Crash Pad next door, easily imagining the whole place filled with musicians on the weekend of May 30, 31 and June 1. That’ll be the first of at least two, and hopefully many, World Music Weekends, where people from all different backgrounds come together to share tunes and songs, dances and conversations, workshops and concerts, laughter and connection. For that weekend we are reserving a cluster of buildings and outdoor space around the intersection of Main Street and Rossville Ave., that will become our festival grounds. Much of the weekend is free and open access, alongside a schedule of workshops, concerts, and presentations that will all be included in the weekend pass. I believe that today’s sunshine and musical bliss is a perfect preview of our special weekend in May/June. Whether you’re one of the lucky few who live in Chattanooga, or planning to visit, I hope you’ll come be part of our first World Music Weekend! – If you are a musical teenager, apply for our “Teen Track” and get ready to learn a lot of music and perform together at the end of the weekend! 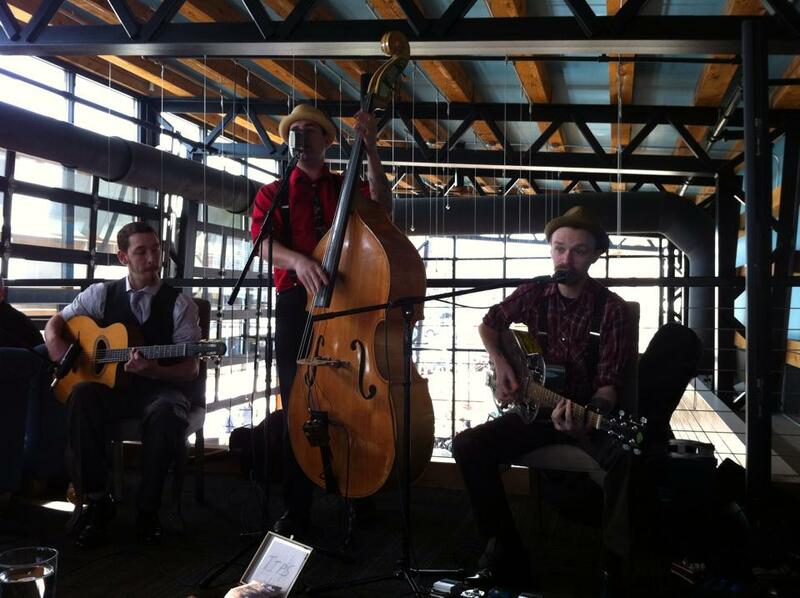 *Lon Eldridge and the 9th Street Stompers play for brunch here almost every Sunday. Live music from 11am-4pm, co-organized by the Folk School of Chattanooga. Today we heard the trio of Danimal Pinson, Jeff Joyner, and Jessica Nunn in the early shift, and now the Stompers are swingin’ it! On June 1st at the Flying Squirrel, we’ll have performances from the participants of our World Music Weekend, and the Stompers will host the show.